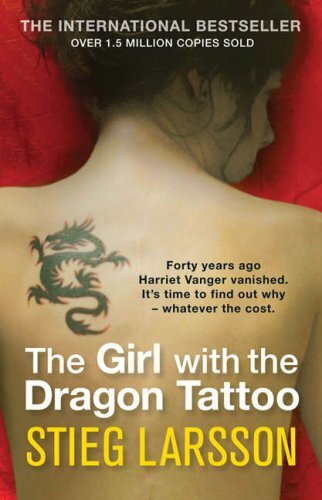 Recently I read the first in Stieg Larsson’s Millennium Trilogy, The Girl with the Dragon Tattoo, which is something that’s always been on my “I’ve-always-considered-reading-this” list but never quite made it onto my bookshelf. One morning a few weeks back I got an e-mail from Amazon offering me a code for a free Kindle book, and this was on the list, so I felt it was finally time to give it a shot (also, the day I turn down a free book is the day I quit breathing). On the e-book topic, I’ve not read many on the tablet, but I’m warming to it from a practicality perspective in that it takes up much less space in my bag – I still prefer reading ‘real’ books though. The Girl with the Dragon Tattoo leads Mikael Blomkvist (played by a singularly brooding Daniel Craig in the film version, whose grumpy visage I had to scroll past countless times to find the book picture instead of the film poster) on a quest to try and solve the disappearance of Harriet Vanger, who disappeared nearly forty years before. After he finds new evidence, against all the odds, in some photographs of the day’s events and in Harriet’s journal, Blomkvist begins to suspect the involvement of a serial killer. Unable to do it alone, he recruits Lisbeth Salander as a research assistant, suggested because she prepared a background on him. Together they attempt to work out what actually happened to Harriet, and who was responsible for the crimes they believe to have been committed. I found the novel quite in-depth and engrossing, though the story is fairly slow to pick up. There’s a lot of potential for it to get bogged down, especially when Blomkvist is researching the entirety of the Vanger family both as his cover story for the investigation and as they are believed to be the only viable suspects. Larsson deals with this well though, and manages to reduce the complications as much as possible. Additionally, he presents biographies for each of the many characters involved, but manages to integrate these into the story to create immersion. I’m not going to discuss the style too much, as some of the clunkier linguistic elements are possibly things getting lost in translation, but on the whole it reads quite well, with only a few points where things seem to get a bit stodgy. The characters he presents are also well-worked, and it’s interesting to read the growth of the relationship between Blomkvist and Salander, giving how starkly different people they are. Both come across as real and believable complex human beings, which adds a real depth to the novel. Very few of the other characters introduced come across as one-dimensional, even those who don’t receive a lot of page time. The mystery itself is presented as a locked-room style mystery on a larger scale, set on an island which (by virtue of a comparatively contrived scenario) leads there to be a very clear timescale and scope of characters. The incident leading to the locked room setting is fairly over-elaborate, but it needs to be something of great interest to necessitate the presence of a photographer as a plot device. The mystery itself is well done as a plot, with more than enough half-truths and complications to throw readers slightly off track, but not done to send them stumbling in thoroughly the wrong direction, especially as more clues develop. The overall themes of the novel are quite heavy and graphic, and there are some parts which did make me want to put the book down and go sit with something comforting instead. But that’s kind of the point; Larsson is trying to draw attention to the unfortunate and darker sides of the world and people’s personalities, especially when abuse and violence towards women are involved. Overall, I enjoyed the mystery and the novel (when your “two chapters before bed” turns into “1am and I want to finish the story it’s hard to claim anything else) and I’ll probably try reading the other two in the series at some point in the future.